My wife has an amazing heart and she’s my best friend, so when she asked me to help with A Cup of Encouragement women’s conference last November, I said, “yes.” Honestly, though, I said it with regret. Hanging out at a women’s conference was not my idea of “fun,” but I maintained my integrity and showed up. So did God. He quickly engaged my heart, captured my attention, and encouraged me during a women’s conference. First, these were amazing women who were sold out to God. They had an amazing capacity to love one another. They ministered to one another in the Holy Spirit. They were nurturing and kind. There was a power of the Holy Spirit that surrounded everything they did. They were honest and open about their lives and shared openly about the good and their challenges. Coming from all walks of life, they had one thing in common: a desire to engage with their heavenly Father in a deeper way and to help those attending uncover a truth about God they might never have found anywhere else. Second, they tapped into the power of the Holy Spirit through prayer. This was their greatest asset. For months prior to the event, the prayer team and organizers gathered to pray for every detail of the event and more. A couple hours after meeting to pray, my wife would return. Changed. Moved. Challenged by the Holy Spirit. She’d share stories of the “prayer warriors” as she would call them–women coming to seek out the presence and power of heaven. Not just to bring a preconceived agenda to have the rubber stamp of heaven–for God to come and to bless all that they were already doing–but rather, to seek the Presence of The Kingdom, asking the Father to have His way and to be all He wanted to be in this time. It was allowing the flow from the throne room of the King into everything they were seeking. Truly allowing Heaven to run the show. Third, they sought God’s healing from their heart wounds. Don’t we all want this? Sometimes we don’t even know we carry these deep wounds which affect every decision we make. I found women were more intuitive about their brokenness. (I know there are those who will criticize me in making this statement, but I am painting with a very broad brush, and in general I think this is true.) Women have the capacity to see the wound, whether they want to recognize it or not, in their lives much easier than us men. For instance, after sharing with my wife about certain revelations of my own woundedness, her loving eyes look back at me as if to say, “Of course, honey, I knew this about you all along. Glad you’re now on the same page with what I’ve known for years.” I love her, she handles me so gently and lovingly, allowing me to come along at my own pace. Finally, they shared their stories transparently. They openly and honestly retold their stories of woundedness and how God’s restorative power worked for the good through it all. Their stories touched my heart. I was tender to the experiences they had to navigate in life and was amazed at how God helped, protected, revealed himself, loved, restored and reclaimed their lives and what was lost; how He restored beyond their imaginations. And yet, there was something that hurt me deeply. (Please, remember the big brush I talked about earlier). As I listened, a common theme arose: at the root of these women’s wounds was a broken man. That is, many times, the pain these women experienced was caused by a wounded man. All that God rescued them from and restored and reclaimed was, in a big way, influenced by the choices–either directly or indirectly–of a man. Men, we need to be better men. We need to be men who are called to be stronger, better than just going through life one day at a time, allowing the hidden and repressed issues and wounds of our lives to come out on our families and the women we love. We need the strength of other men. These women come together and support each other with ease; men we need to do the same thing. As men, we need to come together to support one another. Men need other men, strong men, men who are not afraid to look at the hard and dark places of our lives to discover that Jesus is standing right there. That in this dark and wounded place, we can find the love and grace that only Jesus can bring, reclaiming and restoring what has been stolen from our lives as well. Men, we can find this strength with men who have walked this path, those who have gone before us. As these women come together to support and love on each other, building each other up and supporting one another, we men need to do the same. Life is not meant to be lived in a vacuum of western masculinity, being the strong, silent, lone-ranger. Being strong, silent, and alone only leads us to isolation, hiding, and pain. Jesus didn’t live alone and we shouldn’t either. Jesus surrounded himself with men; knuckleheads he could live his life with, share experiences with, love and live with. He did isolate himself, but only to run to his Father and spend time with him. These men lived life deeply, loved each other deeply, learned together, laughed together, cried together and God used them to change the world. Men, if we’re not living your life in deep authenticity with other men, we’re missing the boat. We all need a group of men where we can live deeply, who can hold our feet to the fire. Men who will look us in the eye and tell us the hard truth about ourselves. If we think we don’t need other men, then we’re living alone and hiding. We are hiding from a deeper part of ourselves where we can really find God. We might have friends—guys we hang out with–but if there isn’t a deep authenticity where we share life with each other, where we can really support one another at the hardest times, then we’re not really connected. I know this is hard, because we all have areas of our life we do not want others to see. I know, because this is where I was until a friend introduced me to a group of authentic men, who shared a common experience. They had attended a weekend retreat by The Crucible Project. Since attending The Crucible Project retreat and connecting with other local Crucible Project men, my life has changed…for the better. And men, we need to change, we need to be better men. We need to take a hard look at ourselves, and we need to do it for the sake of our wives, children, and the world around us. 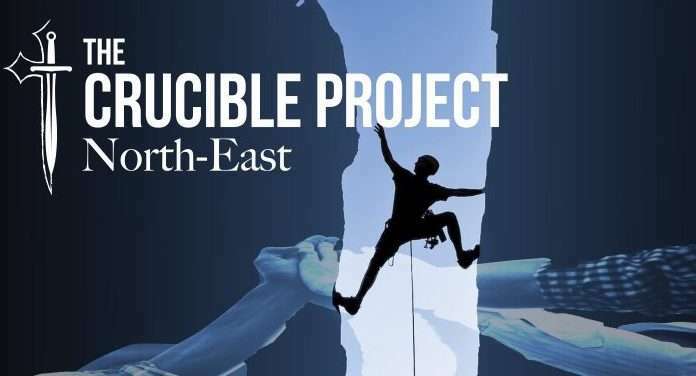 Any men interested in learning more about The Crucible Project, please join us on the last Thursday of the month, 7pm at Wellspring. And, if you want to go deeper, join us for the inaugural Northeast Crucible Project Retreat, April 13-15, 2018 in Andover, CT.